D. L. Conkling, from bicyclist to treasurer, 1909. 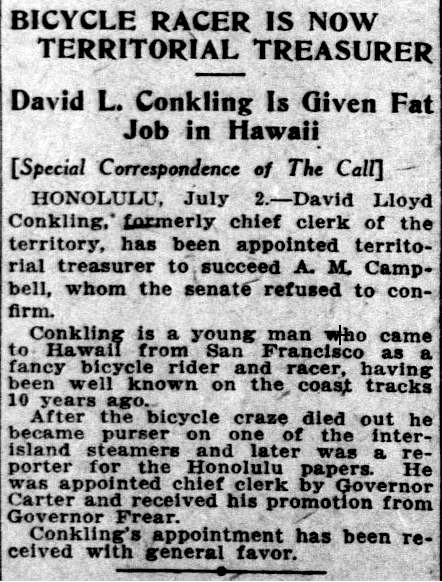 HONOLULU, July 2.—David Lloyd Conkling, formerly chief clerk of the territory, has been appointed territorial treasurer to succeed A. M. Campbell, whom the senate refused to confirm. Conkling is a young man who came to Hawaii from San Francisco as a fancy bicycle rider and racer, having been well known on the coast tracks 10 years ago. After the bicycle craze died out he became purser on one of the inter-island steamers and later was a reporter for the Honolulu papers. He was appointed chief clerk by Governor Carter and received his promotion from Governor Frear. Conkling’s appointment has been received with general favor. San Francisco Call, Volume CVI, Number 41, Page 28. July 11, 1909. Hawaii and the United States, 1911. According to the report by the treasurer of the Territory of Hawaii, D. L. Conkling, in the 12 years which have passed since the annexation of Hawaii to America, the income just from duties during that time come to more than $15,000,000, more than the other states of the United States. In the past year, Hawaii paid $1,772,869 in income taxes and duties to the coffers of America. The rest of the states fell behind Hawaii in duties and income taxes, and therefore what we say about Hawaii being a gold mine for America is true; it is Hawaii who gave it to America then asked questions. All of the expenses for the forts and the dredging of the harbors are paid for by Hawaii’s dollars, and America suffers nothing for Hawaii. Kuokoa Home Rula, Buke IX, Helu 32, Aoao 1. Augate 11, 1911. Hale kukui nani a o Hawaii nei. Hakuia e MRS. W. PA.
Ka Nupepa Kuokoa, Buke LVII, Helu 18, Aoao 3. Mei 2, 1919. 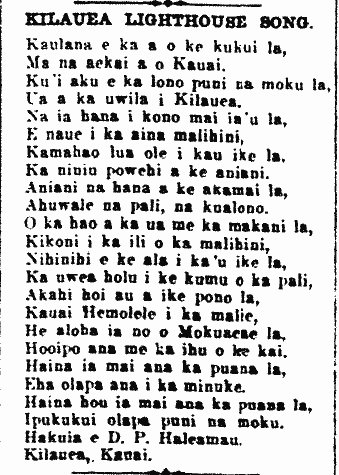 Mele inoa for Kilauea lighthouse, 1914. Ma na aekai a o Kauai. Ua a ka uwila i Kilauea. E naue i ka aina malihini. Ka niniu powehi a ke aniani. Ahuwale na pali, na kualono. Kikoni i ka ili o ka malihini. Ka uwea holu i ke kumu o ka pali. Kauai Hemolele i ka malie. Hooipo ana me ka ihu o ke kai. Eha olapa ana i ka minuke. Ipukukui olapa puni na moku. Hakuia e D. P. Haleamau. Ka Nupepa Kuokoa, Buke LII, Helu 15, Aoao 4. Aperila 10, 1914. Sweet love song written a hundred years ago, 1914. Ka Holomua, Buke I, Helu 40, Aoao 8. Iune 20, 1914. Hula in Hanapepe.—We hear from S. Papiohuli of Hanapepe, Kauai, that the people of this place are turning to the Hawaiian hula, and all of the men and women of the area are doing that idle activity; therefore, we are dismayed at this resurgence of this encouragement of indolence in that place. 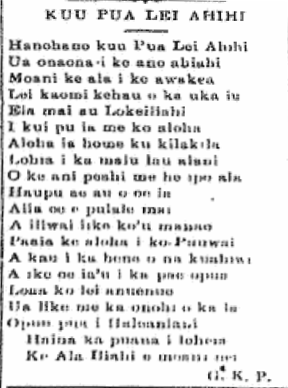 Ka Nupepa Kuokoa, Buke II, Helu 35, Aoao 2. Augate 29, 1863.